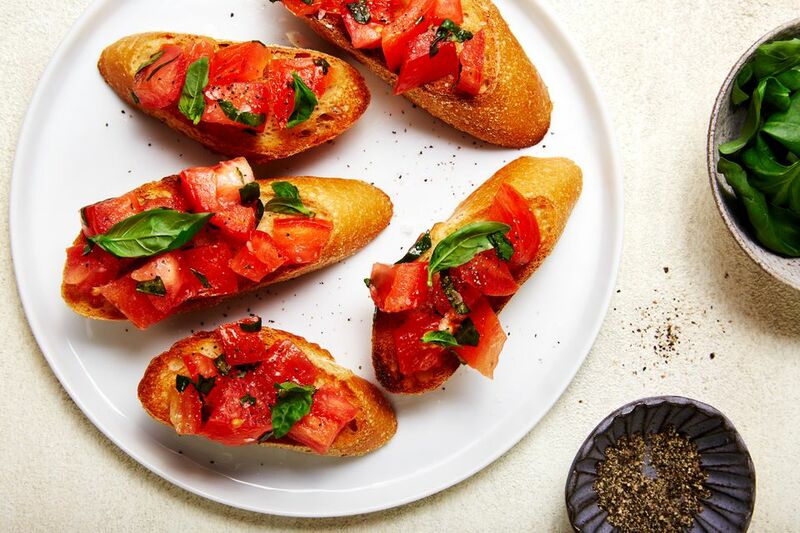 This easy vegan bruschetta is made with fresh tomatoes and basil and drizzled with olive oil. You won't miss having cheese on your bruschetta if you use fresh red ripe tomatoes and flavorful basil. It is best if you grow your own tomatoes or can buy them in season at a farmers market since a ripe seasonal tomato is unsurpassed for taste. You can also grow your own basil or buy it at the farmers market or the grocery store. Sea salt or kosher salt will give the best flavor. Browse through the artisanal salt selection at a gourmet or specialty store to find interesting ones. You can use a little as a finishing salt on top along with the cracked pepper as well. If you keep a gourmet olive oil or salt blend on hand, this is the time to bring it out to give maximum vegan flavor to your bruschetta. Also, note that this recipe has no garlic, so if you wanted an appetizer for a romantic evening, this one is breath-safe. Chop the tomatoes. You may want to remove excess seeds and pulp. Combine the tomatoes, oil, basil, and salt in a covered bowl and let marinate at least 4 hours. Do not refrigerate as the tomatoes will lose their flavor in the refrigerator. Immediately before serving, toast the bread slices lightly. Use a slotted spoon to layer the tomato basil mixture onto bread. Crack fresh pepper over the top. Serve immediately. Bruschetta will pair well with other Italian-inspired dishes for a meal. It can be the cold appetizer, served instead of a salad and bread, or served with a main course salad rather than serving garlic bread.